Back again today with a quick review from my archives, slowly getting through them. I had a bottle of this that I bought in France for like 25 euros. 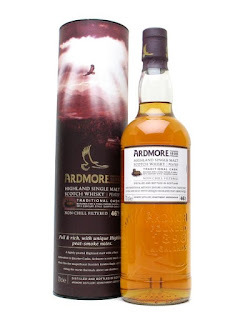 When I first opened it I thought it was great, really balanced peated highland style malt. But as it oxidised it got worse and worse to the point where the last few drams were hard to finish because it was so harsh. It was finished in quarter casks but it’s discontinued now anyways. Nose: Peat with iodine and creamy sweetness balanced well. Creamy barley, cereal, burnt brown sugar, soft fruitiness, vanilla, plenty of honey, fudge, lots of caramel. Water: More peat! Marshmallow fluff too. Taste: More peat than the nose, quite dominating. Minerally with flint, spicy malt, soft earthy peat. Water: Sappy green oak, underlying sweetness- vanilla, honey, apple, pear and nuttiness. Still a bit swamped by the peat though. Finish: Peat finishing strong with pepper, salt and flint. Strong coffee and an unpleasant rubbery texture.